Halloween's the perfect time to play pretend. Keep your child's imagination alive with these Halloween puppets, which come complete with a printable puppet theater and some story ideas to get her started. Just cut them out, grab some friends and go! Bring books to life by having students create their very own character puppets! When they're finished, students can use the puppets to act out their favorite scenes. Little theater buffs can have a blast putting on a home-production with these shadow puppets! These finger puppets represent the three stages of a man's life; can you help him tell his story? Just cut out the puppets, and you're ready to put on a show. Take a dip in the deep blue with these underwater-themed shadow puppets! Practise some hands-on storytelling with these shadow puppets, modeled after The Three Little Pigs. 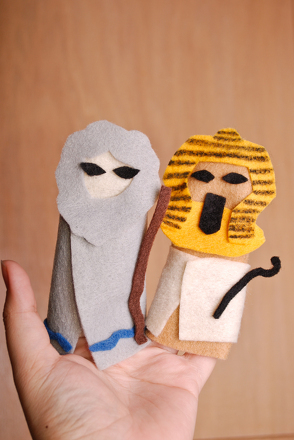 Finger puppets encourage creative play, communication, and they give you a great way to share the Passover story with your kids. These three finger puppets are easy to make, and make play time even more fun. These animal shadow puppets are great tools for building creativity and speaking skills. Just cut out the puppets, and you're ready to put on a mini show of your own. Give your child a hand cutting out and taping the puppets, and put on a show. Give your child a hand cutting out the puppets, and put on a fun show. These three finger puppets are too cute for words! Help your child cut them out, and you'll be ready to put on a puppet show.